Wednesday, January 23, 2013 ratings — New episodes: American Idol, The Middle, The Neighbors, Modern Family, Suburgatory, Nashville, Criminal Minds, CSI, Arrow, and Supernatural. Episode reruns: Criminal Minds, Whitney, Guys With Kids, Law & Order: Special Victims Unit, and Chicago Fire. 8pm – The Middle: 2.5 in the demo (+9% change) with 8.53 million. 8:30pm – The Neighbors: 1.9 in the demo (+6% change) with 6.32 million. 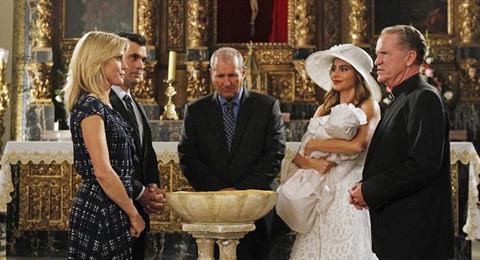 9pm – Modern Family: 4.1 in the demo (-5% change) with 10.81 million. 9:30pm – Suburgatory: 2.3 in the demo (0% change) with 6.28 million. 10pm – Nashville: 1.9 in the demo (-14% change) with 5.47 million. 8pm – Criminal Minds: (rerun) 1.5 in the demo with 6.78 million. 9pm – Criminal Minds: 3.0 in the demo (+3% change) with 11.73 million. 10pm – CSI: Crime Scene Investigation: 2.7 in the demo (+17% change) with 11.49 million. 8pm – Arrow: 1.1 in the demo (0% change) with 3.15 million. 9pm – Supernatural: 0.9 in the demo (0% change) with 2.10 million. 8pm – American Idol: 5.4 in the demo (-10% change) with 15.70 million. 8pm – Whitney: (rerun) 0.8 in the demo with 2.64 million. 8:30pm – Guys with Kids: (rerun) 0.8 in the demo with 2.20 million. 9pm – Law & Order: SVU: (rerun) 0.8 in the demo with 2.72 million. 10pm – Chicago Fire: (rerun) 0.8 in the demo with 2.54 million. What were you watching last night? Week two of American Idol, original episodes, reruns or something better? What about the above “49” age group? We are the baby boomers and I can guarantee you’ll find more viewers in this age group for Nashville. AND, probably more the the other shows as well. Don’t write us off yet. We aren’t dead and we still watch TV.